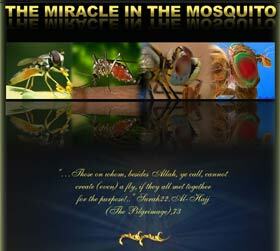 It is Almighty Allah Who creates the immaculate structure in the wings. Chance is the Darwinists' so-called god, that does all things and can even work miracles. According to the simplistic Darwinist world view, time and chance together can bring about all things, in an imaginary manner. On the basis of this irrational belief, chance achieves what human beings cannot, and can in some way possess greater knowledge, abilities and technical means than laboratories and scientists. According to Darwinism, chance is an expert that produced everything, flawlessly and with a glorious complexity and that possesses foresight and takes appropriate precautions. Blind and unconscious chance has become the mythical hero behind all Darwinist accounts of life. For Darwinists there are various ways of imposing this on people. Of course, under normal circumstances no rational personal will believe that a creature with reptilian anatomy completely changed so as to assume the immaculate appearance of a soaring bird. In order to make people believe in such a violation of logic, they need to develop a kind of spellbinding system. That is why Darwinists indoctrinate people in the form of a myth of the supposed capacities of chance dressed up with scientific terminology. According to this tale, every stage in the appearance of all life forms is the work of blind chance, and chance performed this by working miracles. If you ask a Darwinist, "How did the first cell appear?" the answer you will receive will be "It appeared spontaneously in a bit of mud." If you ask how the eye came into being, the answer you receive will be By a miracle." If you enquire, "How did wings and the perfect feathers in birds come into being?" you will be told something along the lines of, "It happened miraculously one day." There is no consciousness or intelligence directing the fictitious process in these irrational and unscientific Darwinist accounts. And yet the universe is built on the most delicate balances. There is a flawless regularity on Earth. The slightest deviation from that order would mean the complete elimination of the whole system. Every form of life possesses exceedingly complex structures and amazing characteristics. Every one of these details is the work of a sublime and mighty intelligence, in other words of Almighty Allah. But this perfect equilibrium and amazing complexity are ignored in Darwinist stories. All these nonsensical elements in the fairy tale of evolution, that is made incomprehensible by the use of scientific terminology, is carefully and constantly employed just like a magic spell, and most people fail even to notice. Chance can never give rise to life, no matter what Darwinists claim. It is entirely the artistry of Allah. No matter how much Darwinists try to maintain this indoctrination, the miracle they in fact refer to is blind, mindless and unconscious chance. Coincidences are events that take place at random, with no conscious agent behind them, and with no intelligent power to shape or design anything. It is of course impossible for an event that takes place at random to find the correct method by trial and error, to predict future events and take the requisite precautions, to design beforehand what an organ will resemble, to be altruistic or to display love and loyalty. It flies in the face of reason, logic, science and common sense to maintain that a fictitious power unable to produce even a pin could give rise to all the glorious variety of life on Earth. The expression "unable to produce even a pin" is used here as a response to Darwinist claims, and to emphasize their impossibility. In reality, of course, it is an error of logic and lack of sound reasoning to suggest that chance can "produce" anything at all. 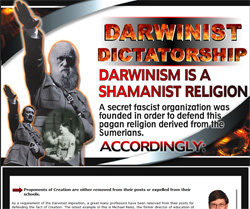 But Darwinists have been able to use that flawed logic to deceive the entire world. According to this peculiar Darwinist logic, there is nothing that chance cannot do, given sufficient time. The aim behind all these illogical ideas, of course, is for Darwinists to be able to bring some other explanation than creation to bear, at least in their own eyes. 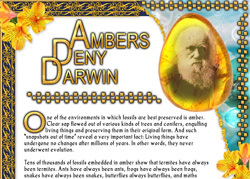 Darwinists are certainly very well aware that it is inconceivable for chance and time to combine together to produce flowers, cats, fish, birds, reptiles and human beings from a collection of mud. But instead of signing up to the truth, they are still trying to depict the illogical as logical. As we have seen, all Darwinist accounts are based on deception. Take away all the Darwinists flowery language, Latin terminology and incomprehensible scientific words and all that remains is the deception of "all life came into being as the result of random events, through a combination of blind coincidences, and with no control process, precautionary measures or intelligent intervention." And this is the deception that Darwinists are really trying to get people to believe. Allah has so ensnared the dajjal that the supporters of the dajjal have had to resort to the myth of "chance," in order to oppose Allah, in their own foolish eyes, an idea which is so illogical and irrational that even primary school children would find it ludicrous. Chance is such a perverse and mindless idea that it would be more logical to suggest that insects used their lofty intellectual abilities to produce highly sophisticated technological equipment. But the spell of the dajjal has convinced some people of this nonsense and made it something that is even taught in schools. But as people have seen how chance has been supposedly deified and endowed with a supposed creative power (surely Allah is beyond that), Darwinism, the worst trickery of the dajjal in the End Times, has become truly pitiable. There is one very important fact that needs to be known about the lie that is Darwinism: Darwinism has to date offered no rational scientific answer to the question of how the first living thing appeared. It is unclear how that fictitious "first cell," which Darwinists regard as the origin of all, or even the first protein inside it could have emerged. The theory of evolution has totally collapsed in the face of a single protein whose origin it is unable to account for. This fact is well known to all Darwinists. That is why they try to gloss it over or make you forget about it in every Darwinist report or program you read or watch. 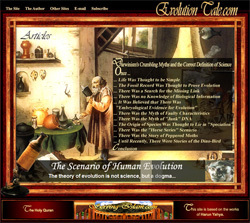 It is impossible to learn from anywhere that engages in Darwinist propaganda that there is zero possibility of a protein forming by chance, that the countless experiments performed over the history of science show that have been unable to produce a single cell protein or a single organelle, and that the structure of the cell is too flawless and irreducibly complex to be able to come into being by chance because these facts demolish the simplistic and unscientific Darwinist account of the origin of life. Bearing in mind that chance cannot even account for the amino acids inside a protein, the theory of evolution's fictitious formula "time + chance + muddy water" is reminiscent of the titles of books of fairy tales written for primary schools. The glorious planet we live on, the Sun, the Moon and the stars are all manifestations of Allah's sublime might and magnificent creation. As we have already set out, other proteins need to be in existence for a protein to form. So Darwinists are trapped in a terrible vicious circle and at a complete dead-end. In order to account for the existence of a single protein they would have to account for up to 100 different proteins, DNA and even the cell as a whole. Darwinism is in a state of absolute defeat on this subject. Yet even assuming that all these things actually happened, that the Darwinist magical formula really works and that the fictitious first cell actually formed (which is scientifically impossible), Darwinists are still in an insoluble predicament. Darwinists have to account for each one of the tasks undertaken by the organelles in a cell, the work done in the body by an enzyme, the emergence and functioning of such complex organs as the liver, spleen, stomach, lungs and brain and, even more importantly, how all these came into being in an immaculate and flawless way through a transition from other living things. But, inevitably, Darwinists never address such matters, let alone explain them. Because it is impossible to account for the wondrous complexity in all organisms, from the smallest to the very largest, in terms of false Darwinist mechanisms. In fact, all Darwinists are well aware that there is a manifest miracle in the Earth and sky and in the creation of man and all living things. 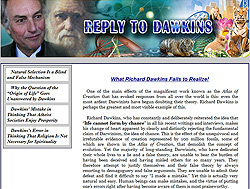 Darwinists themselves know perfectly well that using their own deceptive methods, they can never account for a fertilized cell dividing and producing a human body consisting of 100 trillion cells, of 30 trillion of these specializing in such a way as to constitute the human brain, of the way 12 billion brain cells begin working in a perfect manner by constructing 120 connections between them and, as a result of all this, the emergence of an immaculate living thing. There is no doubt that it is Almighty Allah who created and rules over the entire universe, the Earth and sky and all living things. The order that Allah has created within a single cell is so complex that it cannot even be explained in terms of human ability, capacity and intelligence, let alone by chance. Even Dawkins, one of today's best known atheists, has to admit that no mechanism of the evolution he so fervently espouses actually represents so-called evolution. By these words, Dawkins has had to say that mutations cannot produce any advantageous result and that the profound changes necessary for a life form to move from water to dry land are impossible. These admissions by Dawkins clearly show how the perverse religion that is Darwinism is so blindly revered despite being bereft of any scientific evidence. Ignoring fundamental dilemmas may of course have had an effect people with no training on the subject. But the more people learn about the theory of evolution the more they will start to ask questions about certain glossed over facts, details that have been deliberately glossed over and fundamental subjects that have been covered up. That is the current state of affairs in the schools of various countries, in certain states in the USA and in Europe. Students are rejecting blind instruction and have no hesitation over arguing about these fundamental dilemmas with their teachers. The age of the dajjal's deception of people is finished. The fundamental dilemmas of Darwinism are attracting people's notice, and they are waiting for an explanation of them all. 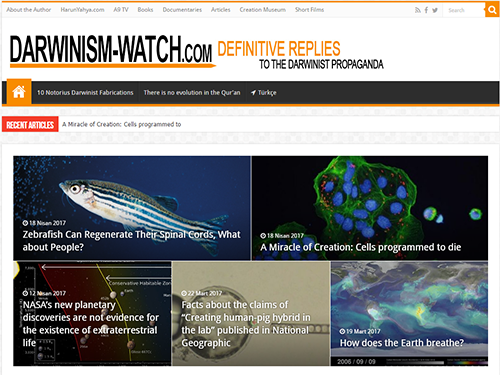 Darwinists' lengthy silence on this issue has even encouraged proponents of Darwinism to doubt it, and people have begun searching for an answer outside Darwinism. Naturally, everyone who is freed from the spell of Darwinism can clearly see that all the wondrously complex life that exhibits intelligence and consciousness was, in fact, created. Mankind! An example has been made, so listen to it carefully. Those whom you call upon besides Allah are not even able to create a single fly, even if they were to join together to do it. And if a fly steals something from them, they cannot get it back. How feeble are both the seeker and the sought! 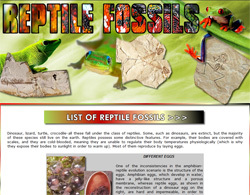 All the fossils, drawings and models that Darwinists depict as transitional forms are false. The truth is that not a single transitional fossil exists. 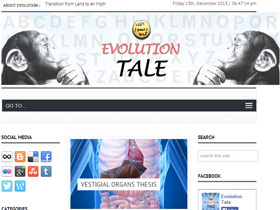 For Darwinists, who for 150 years sought to depict a lie as the truth, who portrayed the countless frauds of the theory of evolution as true and who had that lie taught in school curricula, it is not at all difficult to convince people of the lie that Darwinism is corroborated by transitional fossils. This deception, which has persisted since Darwin's day, began with Darwin's own promise that transitional forms would be discovered some time in the future. In fact, Darwin made a very significant prediction 150 years ago, one that has since come true. Darwin's prophecy has come true. The transitional fossils that failed to be found in his own day have not been discovered subsequently, either, and that fact has totally demolished Darwinism. 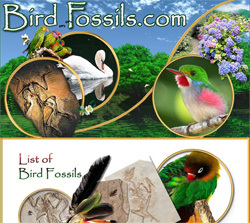 Since that time, Darwinists have tried to convince people that the transitional fossils that did not exist 150 years ago would one day be found. When advances in technology and science made the existence of transitional fossils essential, they found a solution in fraud. All the biology text books in which the theory of evolution is taught today, all the Darwinist publications and the pro-Darwin press carry these false proofs as they discuss the transitional fossil myth, which is of such vital importance to the theory of evolution. 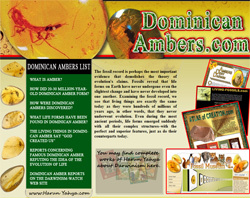 These publications still refer as evidence to Archaeopteryx and Coelacanth, to Haeckel's false drawings of embryos, Industrial Revolution moths glued onto the trunks of trees, Piltdown Man, an orangutan jaw attached to a human skull, Nebraska Man, depicted together with his entire family on the basis of a single wild pig molar, Neanderthal Man, which was actually a human race despite being portrayed as a cave-man, and Lucy, which has been scientifically proved to be an ape and to skulls which were subsequently and hurriedly removed from the literature when their fraudulent nature was exposed. That is the pitiful position of Darwinism in the 21st Century. You will generally find the following expression in Darwinist publications: "There are so many fossils proving evolution that..." But that is a terrible lie. It is merely intended to indoctrinate the people reading it. To put it another way, the classic Darwinist method is being applied, and a lie is being repeated very loud and over and over again in order to make it convincing. The fact is that there exists not a single fossil to prove the theory of evolution. Darwinist scientists are, of course, very well aware of this manifest truth shown by science. 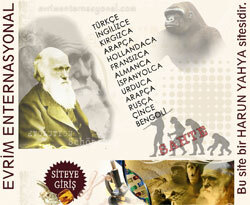 But because of the absence of these fossils, they are also well aware of the impasse facing the theory of evolution. 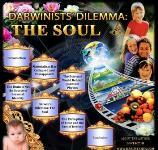 But their dogmatic perspective obliges Darwinists to keep the theory of evolution propped up, no matter what the cost. A fern leaf dating back 58 million years is identical to present-day ferns. 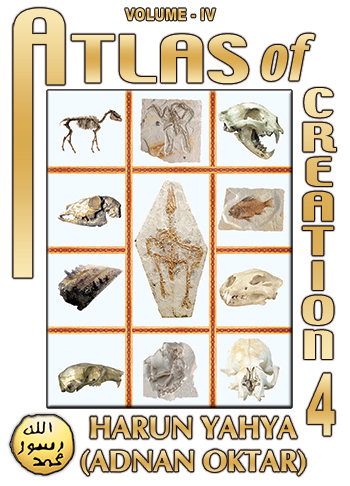 Harun Yahya's Atlas of Creation contains thousands of such fossils. Indeed, a call was recently made to Darwinists, asking them to put just one single transitional fossil in their possession on display in some of the world's best known arenas. But as always, the only response was a profound silence. Yet if their claims were true, if living species really did evolve from one another, very gradually over millions of years and in random stages, then Darwinists should have not just one but millions, or even trillions, of transitional fossils in their possession. But Darwinists cannot even respond to the challenge to produce "just one transitional fossil." This is because they do not have a single transitional fossil. And that is why Darwinists are unable to cheerfully step up and produce a single intermediate fossil. The Darwinist spell has been so systematically imposed on people over the last 150 years that they have come to believe in something non-existent. Nobody has ever asked, "There should be millions of transitional fossils, so where are they?" Nobody has ever said, "All the 350 million fossils produced from excavations belong to life forms with a perfect appearance, but not one is a transitional fossil." Nobody has ever investigated why the same few life forms are always depicted as transitional forms, why even the most eminent scientists have nothing else to point to apart from these fabricated fossils, and why even books prepared as doctoral theses only deal with these few subjects. Similarly, nobody is aware that these few fossils, heralded as transitional forms, actually posses no transitional characteristics at all, and that this is a scientifically proven fact. To summarize, nobody who has fallen under the spell of Darwinism is aware that there exists not a single piece of evidence supporting Darwinism because Darwinists, the architects of that spell, have cleverly and cunningly covered it up. 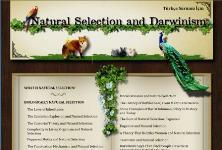 139 Charles Darwin, The Origin of Species, pp. 172, 280.